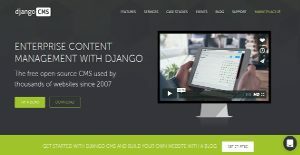 Django CMS is a very popular open source content management platform widely used by content managers, content editors, and website administrators, mainly because of its lightweight core that is easy to implement and integrate with existing systems and other popular applications. The platform is also a huge favorite among web developers as integration with other applications is seamless and the tools it brings enable them to create brand new compatible apps. For content editors and managers, Django CMS comes with a very intuitive and friendly drag-and-drop interface. The whole platform is created around the requirements of multilingual publishing. This means that all pages, content, and websites created using this platform can exist in various language editions. Django CMS is a very robust yet simple and straightforward open source content management solution. It is so powerful that international organizations, brands, and companies including L’Oreal, National Geographic, and Parrot, have opted to use Django CMS to power its content management and delivery systems. Django CMS offers unparalleled versatility, ease of use, and that appeal to novices that attracts even the world’s leading content management professionals and developers. There are numerous benefits Django CMS brings to the equation. For one, users will find it easy to extend the platform. Organizing their documents in a tree style is easy, as well as creating new content types and tree nodes. Integration with existing Django apps is also a breeze. Another highlight that is evident in Django CMS is that the platform is a very mature project. Hundreds of core developers are working tirelessly to improve the product and enhance user experience by adding new and useful features while eliminating bugs that hamper its performance. The platform is also an ideal option for businesses that operate in multiple countries where the need to have websites in multiple languages is imperative. Django CMS is built to support multi-language environments and handles it pretty well in contrast to a number of CMS alternatives in the market. Editing pages and content or adding pages straight to the website is a walk in the park, even for those who are just recently getting familiar with the system. With its double-click to edit functionality, content creation and tweaks become more simplified. If you are considering django CMS it could also be sensible to check out other subcategories of Best Content Management Software gathered in our database of B2B software reviews. Every company has its own characteristics, and may need a special Content Management Software solution that will be adjusted to their business size, type of customers and staff and even particular niche they support. You should not count on locating an ideal solution that is going to be suitable for every business regardless of their background is. It may be a good idea to read a few django CMS reviews first and even then you should remember what the service is supposed to do for your company and your staff. Do you need an easy and intuitive solution with just elementary features? Will you really make use of the advanced functionalities needed by experts and large enterprises? Are there any particular tools that are especially practical for the industry you operate in? If you ask yourself these questions it is going to be much easier to get a reliable service that will match your budget. How Much Does django CMS Cost? Django CMS is a free open-source platform. We realize that when you make a decision to buy Content Management Software it’s important not only to see how experts evaluate it in their reviews, but also to find out if the real people and companies that buy it are actually satisfied with the product. That’s why we’ve created our behavior-based Customer Satisfaction Algorithm™ that gathers customer reviews, comments and django CMS reviews across a wide range of social media sites. The data is then presented in an easy to digest form showing how many people had positive and negative experience with django CMS. With that information at hand you should be equipped to make an informed buying decision that you won’t regret. What are django CMS pricing details? What integrations are available for django CMS? Thanks to its open APIs, django CMS offers extensive integrations that enable users to implement it with a wide selection of business applications. If you need more information about django CMS or you simply have a question let us know what you need and we’ll forward your request directly to the vendor.